Trees hold a powerful place in American constructions of what is good in nature and the environment. As we attempt to cope with environmental crises, trees are increasingly enlisted with great fervor as agents of our stewardship over nature. 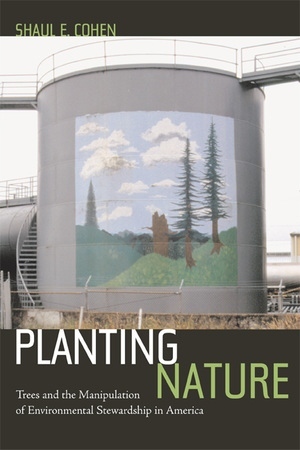 In this innovative and impassioned book, Shaul E. Cohen exposes the way that environmental stewardship is undermined through the manipulation of trees and the people who plant them by a partnership of big business, the government, and tree-planting groups. He reveals how positive associations and symbols that have been invested in trees are exploited by an interlocking network of government agencies, private timber companies, and nongovernmental organizations to subvert the power of people who think that they are building a better world. Planting Nature details the history of tree planting in the United States and the rise of popular sentiment around trees, including the development of the Arbor Day holiday and tree-planting groups such as the National Arbor Day Foundation and American Forests. Drawing from internal papers, government publications, advertisements, and archival documents, Cohen illustrates how organizations promote tree planting as a way of shifting attention away from the causes of environmental problems to their symptoms, masking business-as-usual agendas. Ultimately, Planting Nature challenges the relationships between a "green" public, the organizations that promote their causes, and the "powers that be," providing a cautionary tale of cooperation and deception that cuts across the political spectrum. Shaul E. Cohen is Associate Professor of Geography at the University of Oregon and author of The Politics of Planting: Israeli-Palestinian Competition for Control of Land in the Jerusalem Periphery (1993).